I hope everyone had a great weekend. I wore this outfit Saturday night. Stripes and plaid is one of my favorite combinations for Fall. The scarf I listed above is my exact scarf, I just could not find this color online. It does have the lace detailing on it which is what I really love about this scarf because it just makes it a little different then some of the other plaid scarves that I have. My top and all the fall clothes are 25% off at J.Crew with the code TGIFALL. J.Crew has some of the best Fall clothes in my opinion. Thanks for stopping by. Happy Monday. Beautiful scarf and bag! You look gorgeous, simply breathtaking! I love the plaid and stripe paring! Such a great look! I love your style, you always look fantastic! You always look good in stripes. Love what you did with the pattern mixing! Loving that scarf! So cute paired with stripes. You always know how to rock stripes and plaid! Beautiful! love the scarf and tee! especially in that combination! Plaid + stripes is definitely a winning combo. Love this look! love the stripes and plaid combination and in particular, I love that scarf. it's so perfect for fall while remaining light...and I'm not sure that even makes sense, but it just doesn't seem as weighed down as a lot of the other fall colors. thanks for sharing. you look gorgeous! I absolutely love this look. Stripes and plaid is my new favorite way to mix patterns. Have a great week. 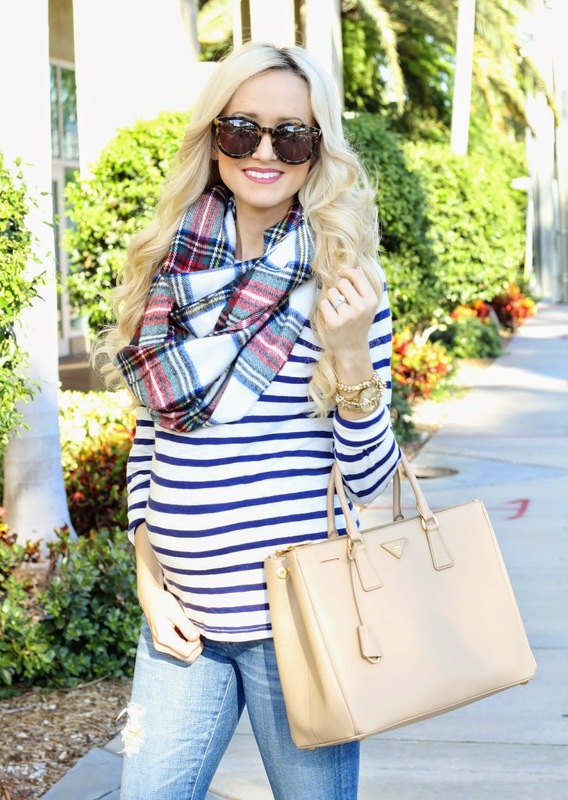 Stripes and plaid is one of my most favorite looks for fall as well! You are adorable! I LOVE that scarf! Girl you always look fabulous, but I'm loving all of the stripes and plaid combo you've been rocking this fall. You look gorgeous. Plus I need that striped shirt in my life, especially after seeing it with that zipper detail! Loving the scarf & bag! You look adorable! Love this casual chic look! Beautiful hair!